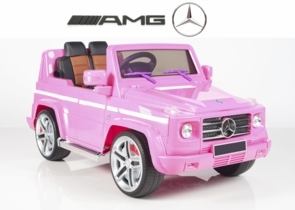 Magic Cars® Pink Mercedes G Wagon truck AMG electric ride on car for children with parental remote control, real rubber tires, authentic Mercedes AMG, working lights, real working stereo, real Mercedes keys, Mercedes floor mat, and real leather seat is the best pink Benz G Wagon for your Princess. Hot pink Mercedes are fashionable and great quality toys that can be driven forwards, backwards, left, and right. Easy to drive for ages 1-7. Holds up to 100 pounds, has dual 12 volt motors, working mp3 stereo, measures over 4 feet long, and over 2 feet wide! Pink electric powered ride on Mercedes cars are so much fun as they offer the fun and feel of a real Mercedes with the parental remote control option. Whether you own a full size Mercedes or not. What a great way to spend your time with your children. Some of our customers like to have their pets as passengers! They will feel like big shots cruising around in their new Mercedes ride on car. Reaches speeds of about 5 MPH thanks to the powerful motors and included rechargeable battery. Drive forwards, backwards, left, and right. Want to let your child control the car instead? No problem, flip the switch in the car and the young driver gets full control. Watch the official Trend Times Magic Cars® remote control ride on RC car commercial below and enjoy what is so amazing today. Buy this car and you will feel like the entire family just bought a full size Mercedes Wagon to enjoy. Still want more? Buy today and for even more added realism you will receive front and rear spring shock absorbers that provide a more comfortable ride. Just like the full size G Wagon! Absolutely amazing and any child will go absolutely wild with excitement. Adults will be shocked at the detail and will want to purchase a Mercedes for themselves. Yes, we carry all spare parts just in case so your new truck will last for years. Arrives mostly assembled with everything you need to starting riding around in your brand new Mercedes! Weight Capacity of 85 Lbs. Fits Children up to 3'6"